You’ve most likely realized at this point that internet marketing involves much more than just, well, marketing. With Google and other search engine algorithms measuring your credibility and worth, internet marketers have to appeal to both machines and humans to succeed. Website responsiveness addresses both of these parties. 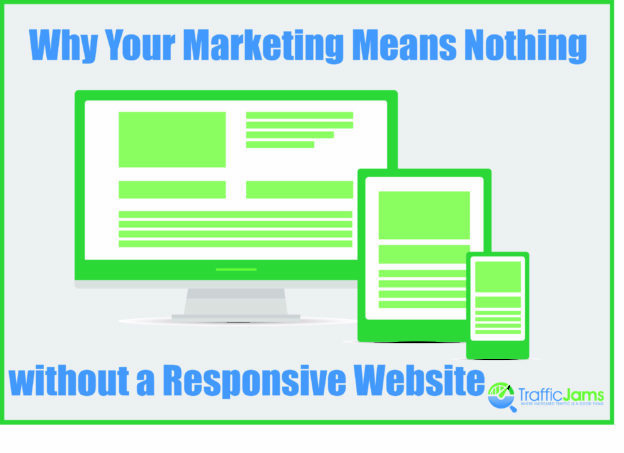 It is so important that without a responsive website, your marketing efforts will mean nothing. But why is that? Shouldn’t your creative marketing and solid content speak for itself? Well, yes. That’s why you need website responsiveness. It gives your business the ability to be seen. Mobile device internet usage surpassed traditional desktop usage in 2015. Research shows that trend will continue, and consumers are using their mobile devices for internet research. They’re buying more often on a mobile device, and using a mobile device more often in general. In fact, 70% of mobile searches are paired with an action within one hour according to Ironpaper research. That being said, if your page doesn’t load, users won’t wait. They won’t zoom in and zoom out to read the text on the site. They’ll find information or products another way. They will delete emails that don’t immediately load. Because of the amount of accessibility on the internet across platforms, users have developed a lack of patience that benefits those businesses that have a clear, easy and accessible website. Not only do people enjoy a quick and mobile-friendly site, Google does too. Because of the surge in mobile popularity, the search engine algorithms adapted to reward sites that display and run well on mobile devices and punish those that don’t. Website presence, speed and usability are all factored into the algorithm that determines search engine rankings. While there are many ways to work on your SEO, maintaining a responsive website is a no brainer and will benefit your business in multiple ways. Need more? Responsive websites will create fluidity across all websites. This means your content any layouts will adjust according to the device it is being displayed on. Your content is always displayed clearly and cleanly, which is why users like it, why Google requires it and why you need it. Because your sites are responsive, your marketing efforts will stand out. While it certainly shouldn’t be your only humanistic strategy, and definitely not your only SEO strategy, responsive websites will allow you to reach individuals more consistently. At Traffic Jams, we emphasize individualized marketing strategies that work to fulfill each business’s unique needs. If you’re looking to master the online marketing world, or for just a little more information, give us a call (855)599-9998 or fill out a contact form today.